Lots going on here in this lovely postcard from the early 1960s. The large white building on the left is the Pickwick Club. It’s still there at St. Charles Avenue and Canal Street, but the retail space is different. Here, it’s a Russell Stover candy shop, now, it’s a Starbucks. Lots of the retail in this photo Ain’t There No More (ATNM): Stevens, which later became Porter-Stevens, Lynn’s, Godchaux, Leonard Krower. The Roosevelt Hotel became the Fairmont, and is now back to being The Roosevelt. 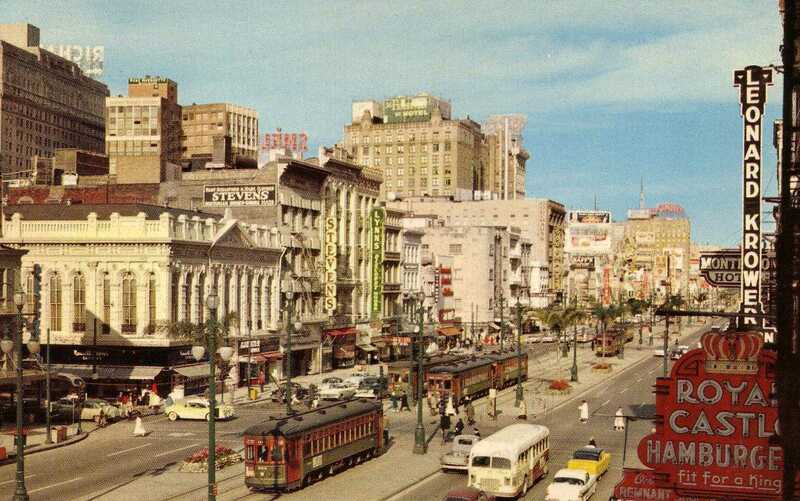 Down the street, in the background, Hotel New Orleans became the Jung, and now is just a hot mess. Three of the four streetcars in the foreground are running on the Canal line. The fourth, closest to the Pickwick Club, is on what’s left of the inbound, outside track, running on the St. Charles line. In 1957, the city ripped up the two outside tracks of Canal’s four-track main line, leaving only one block of the inbound (running towards the Mississippi River) track. That block is where streetcars running on St. Charles end their inbound run, turning from Carondelet Street, onto Canal, going down one block, then turning right again, entering St. Charles Avenue, to start the outbound run. When the Canal line as you see it here was discontinued in 1964, that one block of track was all that remained on Canal Street. Now, with the return of Canal, a switch-back was built just up from Carondelet, between that street and Baronne. That switch ties the new with the old. The white “old looks bus” moving away in the right foreground is the classic maroon-and-white livery of New Orleans Public Service, Incorporated (NOPSI). It’s running on one of the “downtown” lines, such as Elysian Fields or Franklin Avenue. By 1948, NOPSI discontinued all streetcar service other than Canal and St. Charles, replacing them with buses or trackless trolleys. By the time I was regularly riding NOPSI buses, in 1971, most of those “old looks” buses were phased out in favor of more modern, air-conditioned ones. We still rode the older buses on the Cartier and Lake lines, out in Gentilly. Notice that many of the larger signs on top of buildings are facing away from the photographer, who is at Canal and Royal Streets. That’s because most folks entered Canal Street from further up. If you drove downtown from the west, you came in via Airline Highway (US 61), then Tulane Avenue, then Loyola Avenue. From the east, it was US 90, which became S. Claiborne Avenue. Hope you’re enjoying your Saturday! If you have a moment, feel free to share your Canal Street memories/experiences in comments.